The CPUC (California Public Utilities Commission) is not keeping its eye on the ball. Instead of using the new solar law, AB 327, signed by the governor in 2013, CPUC President Michael Peevey took a meat ax to AB 327. To correct this illegal abuse of power by Peevey, Gov. Brown just appointed Michael Picker to head the CPUC, to use his power to correct these anti-community new taxes forced onto AB 327 by Peevey, and so on California cities by Big Oil. Will Mr. Picker correct the damage to this new law that would give more economic power to solar homeowners? Or will Picker ignore the damage done to this solar payment policy and hope the public is too busy watching TV and playing computer games to notice that Sacramento is fiddling while California burns? The intent of AB 327 is to make the homes and businesses in California into productive and profitable “customer solar generators” by 2020, to help California reach the solar mandate of obtaining 33 percent of its energy from solar and renewables by 2020, which will generate safe, clean and free solar power for the state. The intent of AB 327 is to make the homes and businesses in California into productive and profitable “customer solar generators” by 2020, to help California reach the solar mandate of obtaining 33 percent of its energy from solar and renewables by 2020. We have to make AB 327 attractive to homeowners to inspire them to tap their equity, to take out a bank loan and buy 40 solar panels. Or, even better, buy a new solar home with 100 solar panels. Lancaster, Calif., now sells 100 percent solar-powered homes. The CPUC, under its former leadership, gutted the original intent of this new solar payment policy signed by Gov. Brown in December 2013. Instead of heading rapidly towards a future solar economy, based on home rooftop solar, as Gov. Jerry Brown called for in his speech on Jan. 5, 2015, the CPUC raised rates for the poorest people in California, who use the least energy. And then, to add insult to injury, the CPUC cut rates for the top two tiers, the richest people, those who consume the most energy: aluminum smelting and similar huge industrial corporations, which already get other hidden subsidies and pay almost no taxes. Instead of creating an opening for a new solar economy, based on home rooftop solar, which could create thousands of solar jobs, what CPUC did was to raise rates on all the consumers – and lower rates for the rich. This is a direct violation of the mandate which AB 327 gave to the CPUC: Stealing from the poor to give to the rich – while California burns. Instead of deciding to install solar panels on millions of available roof tops, schools and hospitals, so that the energy is being generated in the very neighborhood where it will be used, CPUC decided to fund out-of-state, giant solar farms, owned by Big Oil. The CPUC was supposed to find the best locations for new rooftop solar panels. Instead of deciding to install solar panels on millions of available roof tops, schools and hospitals, so that the energy is being generated in the very neighborhood where it will be used, guess what the CPUC does? This is Big Oil’s idea: Blanket the desert with solar panels, then ship the energy hundreds or thousands of miles away, denying homeowners and farmers the opportunity to be paid as customer-generators to generate clean energy at the exact place it will be used. They frequently emphasize out-of-state, giant solar farms owned by Big Oil, in Nevada, Idaho, Oregon and Washington – creating almost no jobs in California. Our goal must be to give the solar homeowners the lion’s share of the money made from our new solar economy. 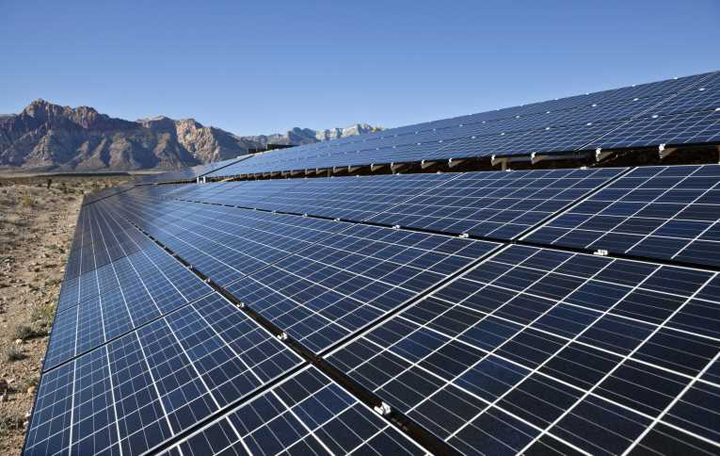 California must achieve 33 percent of its energy from solar by 2020. That is what the new California Solar Payment Policy, AB 327, mandates. Gov. Brown recently called for California to achieve 50 percent of its energy from solar and renewables by 2050. This is a great goal. It can create even more jobs for solar installers. We need to keep our eye on the CPUC to help them achieve the goal Gov. Brown called for. We can add solar panels onto 10 percent of the homes, as many as 500,000 homes, so the homeowners will get the lion’s share of the benefits from selling solar to PG&E, such as free energy and earning hundreds of dollars a month for selling their surplus onto our grid. If we choose this path, this will create more than 60,000 jobs for the architects needed to design new solar homes, each with as many as 100 solar panels on the roof. These homes are like those which are now very common in Europe. Jobs will be created for all the electricians, carpenters and installers needed to build solar homes. These are long term California jobs. These are jobs that cannot be exported. These are jobs many young people can learn and do now. Jobs will be created for all the electricians, carpenters and installers needed to build solar homes. These are jobs many young people can learn and do now. Creating 100,000 new solar powered homes per year, through installing solar panels, until the state has achieved energy independence, is a job that cannot be off-shored. Lancaster, Calif., is already building hundreds of these 100 percent solar powered homes. To really turn a solar home into a moneymaker, making $300 a month extra, we need to build solar homes that generate 200 percent solar, so the owner can earn $0.49 kwh selling the surplus to PG&E. Yes, we can make PG&E pay a premium for the solar we sell onto our grid. Or we can watch the oil corporations build giant solar farms on the deserts in Nevada and Idaho, which are owned by Big Oil, so that Big Oil gets most of the benefits from solar and creates very few jobs in California. That comes at twice the cost to the ratepayers of California. We refuse to sit back and let the oil companies take over the solar industry. Solar belongs to the people. Logic mandates we must shift rapidly to solar. Global warming is caused by burning gas, oil and coal. AB 327 mandates we must reach 33 percent solar by 2020. It is doable. We now have electric cars: Smart, Nissan, Fiat and Toyota, with batteries large enough to power an efficient solar home for three nights. So your home has energy at night. Bingo. The two main parts of the solar solution are now here: cheap solar panels that last for 60-plus years and e-cars that provide nighttime power, when the sun is down. The two main parts of the solar solution are now here: cheap solar panels that last for 60-plus years and electric cars with batteries that provide nighttime power when the sun is down. Such e-car and solar home units can be networked to create local grids to power neighborhoods. This can be a reality within three years. Gov. Brown has appointed Michael Picker to head the CPUC, to use the Cleanup Doctrine to correct the outrageous damage Peevey did to the whole future solar economy of California. Mr. Picker was at the inaugural speech by Gov. Brown. Did Mr. Picker hear the clarion call Gov. Brown issued for 50 percent solar and renewables by 2050? That is the trend, as it is in cities all over Europe and Japan, which are shifting from gas and atomic energy to solar. We don’t need to reinvent the wheel. We can use the leadership provided by Germany and Japan to build our solar future here in California. Many cities in Europe were damaged by radiation from the Chernobyl explosion. Many cities in Japan have been exposed to radiation from Fukushima explosion. These homeowners want to move rapidly towards solar and away from gas and atomic energy. That is why this Solar Payment Policy (SPP) has spread so rapidly worldwide, especially in areas where people have suffered the most damage. Developing countries in Africa, Latin America and Asia can leapfrog out of the poverty caused by oil corporations into a bright, clean future if they move rapidly towards building solar homes and developing a solar payment policy in their cities. We should not wait until there is an earthquake and Diablo Canyon nuclear power plant explodes. We should learn from the explosions at San Bruno, Fukushima and Chernobyl. We can move quickly to safe, clean, quiet, free, non-explosive solar today. Community advocate Theresa Coleman and solar energy advocate Paul Kangas can be reached at theresalynncoleman@yahoo.com and dr8kangas@me.com, respectively. Except Solar can not give continuous power or peak power keep dreaming greenies. Get your head in reality. If a home has 100 solar panels, which is common in Germany, and has a e-car in the garage to store energy, then the e-car powers the house at night. Germany now has 109 cities that are 200% solar powered. Germany banned fracking with solar & wind. Norman my friend, you should really google Schoenau, Germany. They run the whole city on solar & wind. but Germany is doing it. A solar economy looks impossible, until it is done. In the process you can create 500,000 jobs for young people. The sun has been giving the earth continuous power for 15 million + years. Science says the sun will last for another 15 BILLION years. Time for you to buy 20 solar panels. If you do, I will help you install them for free. I will sell you a new house with 100 solar panels on your new roof. You could soon be making enough money from your roof to pay your mortgage. Your sun will be paying your mortgage. Better than your son paying your mortgage. Hey I resent that. I am not George Orwell: I created CCA and my rhetoric is local power (localpower.com) – look at what we do and have done and you will see you speak meanly of your only hope for local green jobs in San Francisco. Why does Marin Clean Energy get its power from a Shell Oil wind farm in Idaho? Once CCA & Shell get their $1.3 billion from a county, then there never is a build out. Green Point Nursery in Novato was banned by the Audubon Society & MCE from installing 1,000 solar panels. MCE has never stood up for Green point Nursery's right to install solar on their own land. Why? Why? Why? Because Shell oil does not want competition from solar home owners & solar farmers. Anytime someone tells me that what they are selling is "The only hope for jobs", I smell a snow job. You can not show me 100 jobs created by CCA in any city. CCA is a corporate run scam. CCA is just giving money to Shell Oil. CCA should be opposed by all community groups fighting sexism & racism. Paul – I really appreciated your talk at Occupy last week. I would like to work with you on drafting a solar payment policy for San Francisco. Please call me. Would you support a solar payment policy that would require PG&E to pay solar homes who sell energy onto the grid $0.49 kWh? Hermann Scheer says that is the best way to shift our economy from oil to solar. What do you say? Yes, but do you advocate for decentralized roof top home based solar??? CCA seems to give money to Shell Oil, i.e.., MCE, & Bright Source ( Israel ) CPSF, etc. and Sonoma Clean Power. false words to cover up what they are really doing. If they are giving billions to Shell Oil, like Marin Clean Energy, they call it "clean" energy when it is actually just dirty energy. There is no way MCE can segregate electron on the grid. Dirty energy is mixed with "clean" energy from dirty Shell Oil & dirty Bright Source. Anytime someone tells me "I am your only hope", I know I am dealing with someone who is a lobbyist for Shell Oil. Ab 327 was written to relieve middle class famalies from the artificial tiered rates. The rates have no bearing on what utilities pay to produce electricity. This legislation was written by a Fresno legislator whose constituents are overcharged by the higher tiers, so the tiers must go. We don't need to keep the tiers high to sell more solar. That is what Mike Peevey said. We shall see what the final repair of AB 327 looks like. Gov. Jerry Brown wants California to be at 50% solar by 2050.
solar home owners who selling energy onto the grid. Give power to the solar home owners. earn $300. a month from solar. That what AB 327 was designed to do. Designed to drive a new solar economy. We are so lucky to have Jerry Brown as Governor. Interesting article. I am for green energy and willing to subsidize solar energy. OK. It will cost you only $20. / year if you are a normal tenant living in a 2 bedroom apartment. Hey, I agree. I spend $20./ a month on beer. Why would I mind spending $20. / year if I can shut down Diablo Canyon. This is criminal what PG&E is doing to you. Please keep adding 10 panels a year onto your lot. PGE will refuse to pay you. to require them to pay people they are stealing from. Clearly this is a form of Fraud PG&E is doing, by not paying people feeding solar onto the grid. and do not get paid. It is time to recover those $$ millions of dollars stolen. This is a very well written article. I am impressed with the 2 writers: Coleman & Kangas. I missed seeing your sarcasm flag. I can make an income from selling the solar onto our grid of $500. a month. Except that PG&E won't give me the money from that solar I feed onto our grid. That is clear theft from people who have solar homes, by PG&E. If I struck oil on my lot, I could sell the oil for $500.+ a month, and no one would say I couldn't get paid. How can PG&E deny those of us with 100 solar panels on our roof the right to get paid a fair price for the solar energy we sell onto our grid? SF needs a law that requires PG&E to pay $0.49 kWh to anyone who puts solar energy onto our grid. If I hit oil in my back yard, no one would dare say I can't sell it. PG&E tells me I can't sell my surplus solar onto our grid. PG&E should not be able to tell me what I can or cannot sell. to get the PUC to require PG&E to pay me $0.49 kWh for my solar. This what democracy looks like. Where the solar home owners make the lions share of the money from solar. if each new home has 100 solar panels. build a solar home with 100 panels, and then sell real clean solar energy to their neighbors, for clean money. MCE is selling toxic atomic energy to people, claiming it is "green" & clean, when it is just toxic nuclear energy mixed with 1% wind & solar. You can't segregate electrons on the grid. It is all mixed up. The only way we can get solar on the grid is to push gas off the grid. Thank you Rosemary. Theresa & I deserve equal credit. Oh, and thank you for inviting me to the LWV forum on solar. I met an engineer there, who built the atomic reactor at Fukushima. at 275 Battery & Sacramento, at 3pm. We rally for solar in Japan, to keep the nukes shut down, … forever. All the nukes are shut down. because Japan is going 100% solar by 2041. Read the book: "Energy Imperative", by Hermann Scheer. If the people do not have a positive VISION, they will perish. I received this vision from Hermann Scheer's book "Solar Economy". And now Theresa Coleman and I offer it to you. Together we all can build this dream of every family owning a 100 panel solar powered house. Once a family has a solar house they will be able to take power away from Big Oil. Shut down coal, oil, nukes and gas. Speak truth to power by generating your own clean power & sell it to your neighbors. The sun will pay your mortgage. I realize you may not understand how homes in Germany now have their mortgage paid by the sun. It is because they have this amazing solar payment policy. Nothing will happen with climate change in Paris 2016, until we in SF first make changes here. If each district in SF would build one 100 panel solar powered house, we could start a movement. Let's build a 100 panel solar house in the Bay View first. Which district will be first? It is so nice to see someone quoting from dear Hermann Scheer. He is the father of the Solar Economy. PM Angela Merkel has adopted the solar payment policy for Germany. The hero of Fukushima is PM Naoto Kan. Please sign the petition to abolish the tax on solar panels. Teresa and Paul have written a very important article about the possibilities of every building in California becoming a producer of solar generated electricity. Hermann Scheer's wonderful book "The Energy Imperative" explains in fascinating detail how Germany created a successful solar revolution. Teresa and Paul are telling us to pay attention to what the Germans have accomplished in spite of their own powerful utility corporations opposing solar power. We need to stand up to P.G.&E. and their political cronies and demand a solar feed-in-tariff that will encourage all citizens to invest in their own solar panels. If cold, cloudy Germany can do it , so can we in sunny California. Peter please forward this article to all your friends, and Harvey Wasserman and Gov. Brown and the CPUC. Thank you in advance for all the great work you do. Does your city have a solar payment policy that requires PG&E to pay solar home owners $0.49 kwh? them figure out how to move our economy towards solar. We are in an urgent climate crisis. This article makes it very clear that we in SF want solar panels on 10% of the homes first. such as Ivan Pah, on the California Nevada boarder, which is owned by Bright Source, a large corporation, owned by the state of Israel. Clean Power SF is hiding the fact that they are planning to import solar from S. California. on a plot of land where I had a 100% guarantee of striking oil? The bank would gladly loan me the money. to build a house with 100 solar panels? Enough income to pay off the cost of the panels in 7 years, if I was being paid $0.49 kwh. And pay off the mortgage in 15 years. refused to install 100 solar panels on my huge roof. “Your current bill is only $50. a month. You have no need for 100 solar panels. We will not pay you for your surplus. We have a Net Zero system here in California. You can only generate enough solar to equal your bill. You are not allowed to make money from generating solar energy. You can only make money selling oil, gas, coal or atomic energy. We don’t accept surplus solar energy. We will not pay you. I am now building a house with 100 solar panels. we will get paid a reasonable amount for our solar. the government would gladly pay me $0.53 kwh. bring on the solar revolution. Ingrid: This article gives me great hope. Moore''s Law says that Personal Computer power would double every year. Now it is predicting solar panels power will double every year. And the price will fall 30% every year. This solar revolution is moving fast. by building homes that are have 100 solar panels. Thank you, Paul Kangas and Theresa Coleman. We need to bury Big Oil with the Dinosaurs. People must make AB327 work throughout California OR, better yet, work for nonviolent anarchist revolution and build all the 100 panel solar homes they want. No one needs the State or PG&E for anything. Long Live Solar Anarchy! Thank you Bob for your support. Now please go build a new home with 100 solar panels. In that way we can create 100% local union jobs, …. 100% local solar generation, … to help prevent the corporate front, … fake "community choice aggregation", from importing solar from southern California. George Orwell warned us that the corporations would green wash every evil thing they attempt, to look like the opposite of what it is. CCA is a fraud. It is not community. It gives us no choice. It is not local solar. Please forward this article URL to Gov. Jerry Brown. If enough people talk to Brown he may join with PM Angela Merkel, of Germany, and demand PG&E pay solar home owners $0.49 kWh for selling solar onto the grid. Love the article, such an important topic we need to hear more. The Sonoma Clean Energy company comes from Southern California and apparently is owned by Israel! We need local roof top solar energy! This judicial notice by Judge Mandelbaum, in NYC, is very, very, very important for our struggle. Coupled with the NY Supreme Court decision that cities can ban fracking gives us leverage to require Utilities to pay solar home owners $0.49 kwh for selling solar onto the grid. This is how the People of Germany were able to win their right to require Utilities to pay $0.99 kwh, because every level of courts in Germany ruled for the solar payment policy. We inevitably will win this battle against Big Oil. Everyone who wants California to adopt a solar payment policy could help our cause by emailing this article to Gov. Jerry Brown. He will do what needs to be done if we each pressure his to do it. Bay View news has given us a great tool, now people just have to feed it to Gov. Brown. Please. If we do not want Big Oil controlling solar energy, ( using the CCA trick ) then activists in each city need to convince their city council people to pass a solar payment policy to require PG&E to pay those home owners who sell solar onto our grid, a premium price so they can pay off their 33 solar panels in 7 years. Its only fair. PG&E should be controlled by the solar home owners, not Big Oil. When will the CPUC ever speak up for roof top, home based solar solar? Great article and information by Paul and Theresa. Why does it seem that Germany, China, and parts of Europe seem to be more forward-thinking about renewable energy? Why can't sunny California catch up with Germany? by every reader of the amazing SF Bay View News. America's need for more solar jobs for all our young workers??? One solution to the Climate Emergency is for most homes to install 20 solar panels. A better solution is for all new homes to be built with 100 solar panels. like CPSF is planning to do. Opt out. Boycott Clean Power SF. This incisive article has developed a life of its own. It has gone viral around the world. 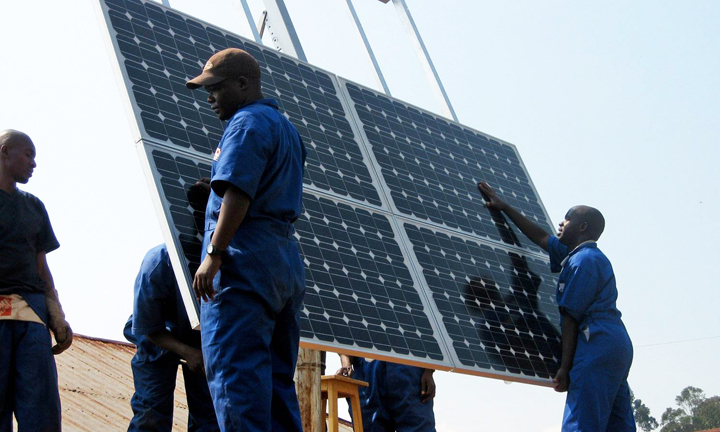 There is a great thirst for good information on how solar can create more jobs than oil. And more clean money. Change is going to happen when you & 5 friends build a house with 100 solar panels. Go the bank, get a loan, buy land, build your own new solar city, where each 4-plex house has 100 solar panels. Do not wait for the government to help you. The income you make from selling your solar energy onto our grid will make you enough money to pay for the mortgage in 20 years. Solar is the new oil. Solar is the new gold. Exodus. Every generation must find its own way to break from the slavery of the past. Now we are enslaved to Big Oil. We must find our way to build homes with 100 solar panels, as our chariot away from Shell Oil, nukes, fracking and coal. Who will build the first home in California with 100 solar panels?? This is such a great article on solar. Please reprint it for Earth Day April 22nd. The largest solar conference is in SF on July 14th – 16th at Moscone Center: InterSolar. There will be speakers from 69 nations around the world. Elizabeth Warren & Hillary Clinton are running for office. What is Warren saying? The #1 issue facing the world is the climate crisis. Leaders are people who are able to inspire the majority to take action to solve the #1 problem first. We can eliminate oil wars, unemployment, sexism, racism and crime by shifting our economy to solar & wind. Warren never expresses any ideas in her whole career, showing that she understands solar economics or solar science that can create a whole new world based on peace & equality. If the US was to build 1 million solar powered homes in each state, in the next 5 years, like Japan is doing and Germany has done, this would stop our need for fracking, off shore oil drilling, the oil pipelines, oil trains, coal and atomic energy. There are now home owners in 69 nations around the world living in solar homes, where the sun pays their mortgage. The world is crying out for solar. Warren is unaware that a worldwide 3rd industrial revolution, based on solar is sweeping the world. If the US would go 100% solar & wind, thus providing leadership for the world, Iran would see how energy is created, and would not need to build nuclear energy. Iran does not need atomic energy. We must disarm Israel, take away the 666 atomic bombs they have, by going solar. How can we wake up Warren and Hillary? Wake up articulate the #1 issues first. Why is the US the most backwards nation when it comes to climate change? "How" China is making the gains in solar, is more important than the %. They are doing it by a decentralized, home based, roof top solar thermal & PV installation. It requires the Utilities to pay the solar home owner $0.70 kwh for selling energy onto their grid. This is producing a huge "gold rush" by homeowners into making money from solar. China is slowly creating a very large "solar money middle class". Solar rich people are the new middle class in Germany, Japan, China & 69 nations around the world. Remember the oil rich Beverly Hill Billies? That was the American dream. Get rich quick on oil. The Chinese are pursuing the "get rich slowly" dream using decentralized roof top solar solar. In the process they are creating a nation that will be 100% solar by 2041. We in the US need to build more solar homes with 100 solar panels if we ever home to stop the climate emergency. I was thinking about Earth Day, so I decided to re-read this fine article. I applaud the authors Theresa Coleman and Paul Kangas. I hope they continue to write more such articles. Thank you Ingrid for your support. Theresa & I are write a new article about the gas pipe explosions in San Bruno, NYC, Fresno and showing how they can all be prevented by cities adopting solar homes with 100 solar panels each. California Cities can all go 100% solar if they adopt a Solar Payment Policy that requires PG&E to pay solar home owners $0.99 kwh. Clean Power SF will be powered by REC's, a mere paper fraud, and gas, which causes fracking and uses more precious water, that we can prevent, by going 100% solar. This wonderful article by Theresa Coleman & Paul is a perfect match for the article in the Solar Times newspaper about how Marin Clean Energy is selling gas as a clean & "green" energy when it triggers more fracking. MCE is a fraud. Gas is a dirty energy. The key demand of young people is for more jobs, and clean energy. By building a thousand new solar homes, 4- plexs, each with 100 solar panels, SF can create thousands of new union wage jobs, and stop fracking by generating more solar. This is a great article. I am so glad the Bay View News is showing people how we can create more jobs by building solar homes. 2940 16th st, & Mission, rm 302. Free. Sponsored by Abalone Alliance & Solar Justice Institute. reactor in California. A huge coalition of dozens of groups is gather like a storm to rain on atomic energy. Come hear one of the funniest, most well informed speakers against nuclear power: Harvey Wasserman. Experts believe solar energy has the ability to work for more of us. However, we need to increase efficiency and reduce the costs of generating electricity from solar energy. With continued research, solar energy could help brighten our future. What does California use for power when nuclear reactors are offline?